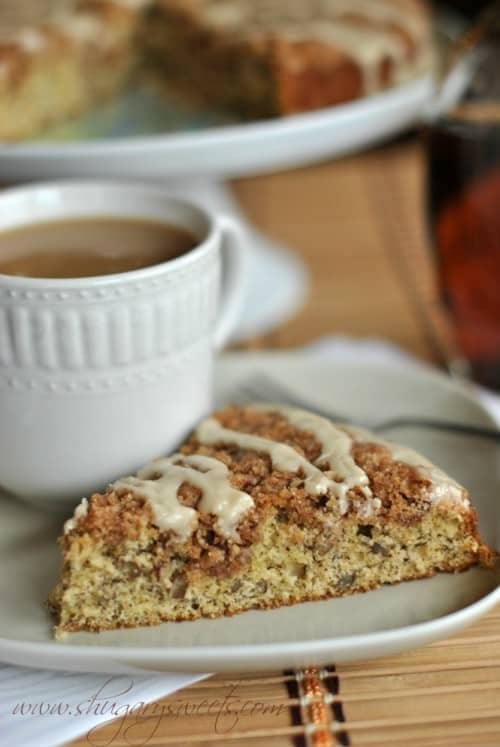 Turn your traditional Banana Bread recipe into something even better! I added shredded coconut and macadamia nuts to my favorite recipe! INCREDIBLE. If you’ve got a bunch of bananas ripening faster than you can eat them, print out this recipe quick! 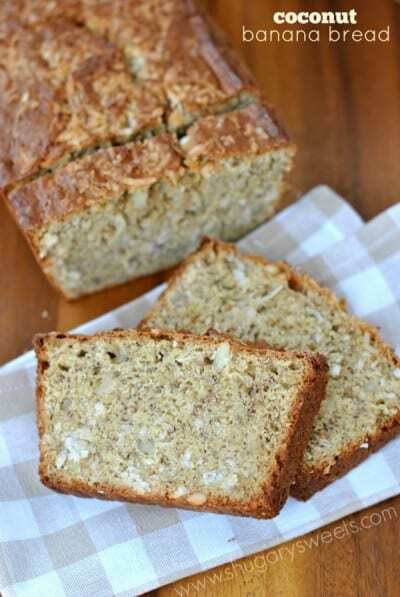 Delicious banana bread packed with coconut and macadamia nuts. What’s not to love? My family eats a lot of bananas. But the bananas can’t have ANY spots on them or my kids freak out. They don’t realize that they are even sweeter as they get more ripe! So with refrigerated, spotted bananas, my kids think the fruit is growing some sort of fungus, and those bananas just sit there. Which they did. They sat in my fridge for about 4 days, untouched. So, I had a banana baking fest! One of the recipes that resulted was this incredibly moist, Coconut Banana Bread. By adding in the shredded coconut the end result is a banana bread with the perfect crumble. Normally I like nuts in my banana bread, and will toss in some chopped up walnuts. But since I was going with the coconut, I added in some Macadamia nuts instead. This bread makes one beautiful loaf, which you can eat immediately. Or, after cooling, wrap in foil and place in a gallon size ziploc freezer bag for later use! It’s perfect served at a Mother’s Day brunch too, ya know? ENJOY. 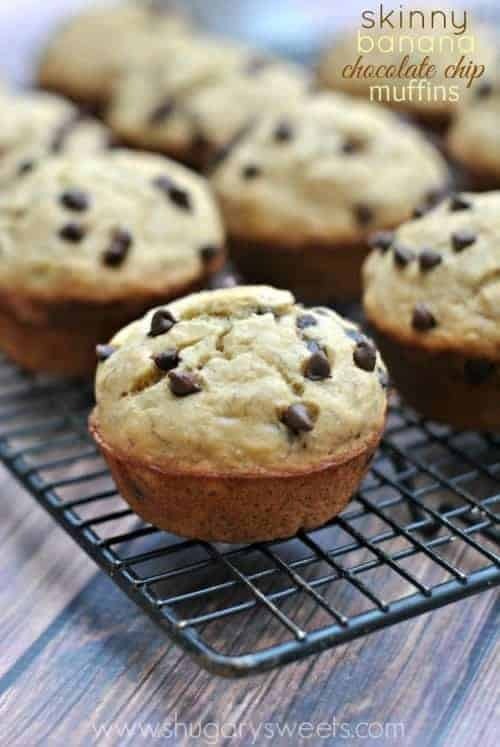 Skinny Banana Chocolate Chip Muffins…guilt free! In a large mixing bowl, beat butter with milk and sugar for one to two minutes. Add eggs and mashed bananas, combine completely. Add flour, baking powder, baking soda, cinnamon and salt. Mix until fully blended. Fold in coconut and macadamia nuts. Pour into a greased and floured loaf pan (I used a 9inch by 5inch pan) and bake in a 350 degree oven for one hour. Remove and cool for 15 minutes in pan. Remove from pan and cool completely on wire rack. Store in an airtight container at room temperature for up to 4 days, or freeze for later use. That banana bread looks delicious! Last year I made coconut zucchini bread and it was marvelous. Considering I love banana bread I know I would love this version too. 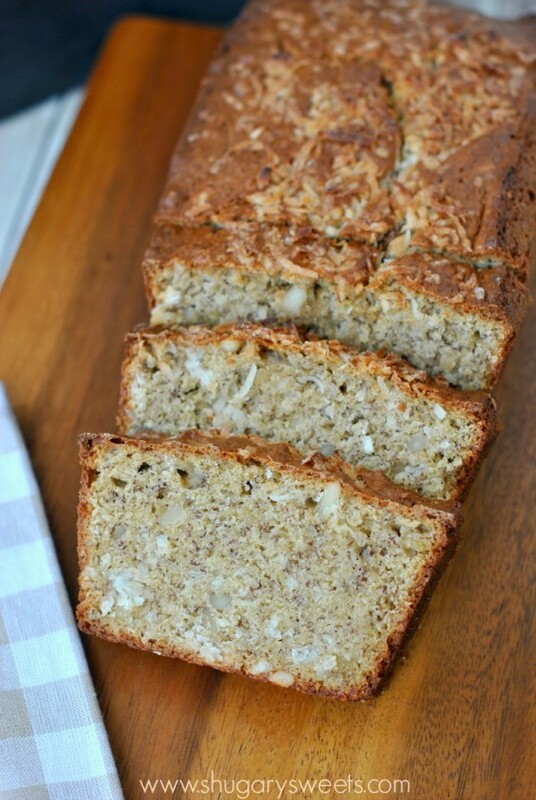 LOVE a coconut zucchini bread idea!! I’ll remember that one when my garden is exploding with zucchini this summer! LOVE this combination of flavors so much. 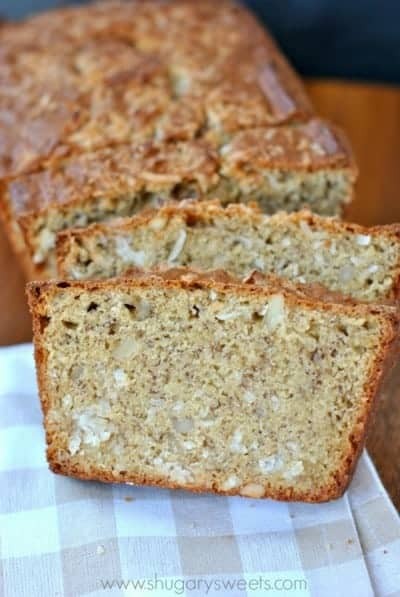 Banana bread is a favorite here and I will have to try this version soon. Thanks! 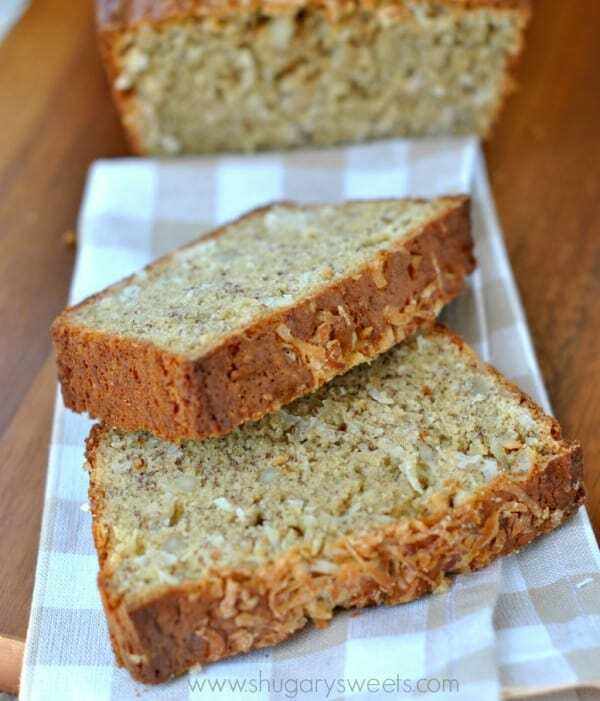 well NOW I’m obsessed with the idea of coconut in banana bread-so tropical! What a great combination of flavours! I’m definitely going to give this one a try (pinned!). I would love a slice of this bread right now! Sounds fantastic! It took me forever to figure out bananas got sweeter as they got riper. Now I am so much wise 😉 I cannot leave banana bread alone – the coconut would make it even more addictive! You’re just the cutest Mary Frances! I can’t leave banana bread alone either! Hello..this is my first time commenting although been long time follower now 🙂 Just made this last night and it was a hit. I am making it again for a friend who just had a surgery…it is a nice feeling to give comfort to somebody with as simple as giving some banana bread. 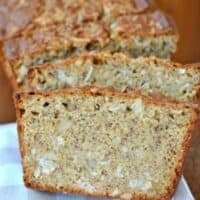 This coconut banana bread rocks my socks off girl! Can you just bring me a big slice tomorrow morning so that I don’t have to make breakfast??? 😉 Pinned! looks delish. 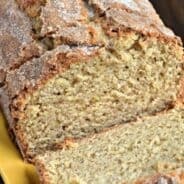 i have a quick question though – what substituions could be made if i didn’t want any banana in the bread? i know it’s silly but i hate the taste of bananas but i love coconut and macadamia nuts. I love this recipe! 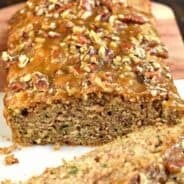 It’s my go-to banana bread now whenever I have browning bananas! Thanks! 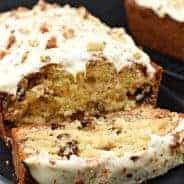 love banana bread-will try after I obtain ingredients–bananas ,keep some in freezer so always have available.-like pecans better–thank you so much for sharing this glorious recipe -how on earth do you think up such wonderful combinations!!? ?–love to you! This sounds amazing! Question, I’m not a fan of cinnamon in my banana bread, can it be omitted? Also how many cups of bananas is equivelant to 2 large bananas? Would 3 small work?